The discovery specimen for the legendary, seven known gold 1787 Brasher Doubloons will be displayed by PCGS along with historic New York copper coins at the ANA 2018 Philadelphia World’s Fair of Money. Photo credit: Professional Coin Grading Service. Hover to zoom. 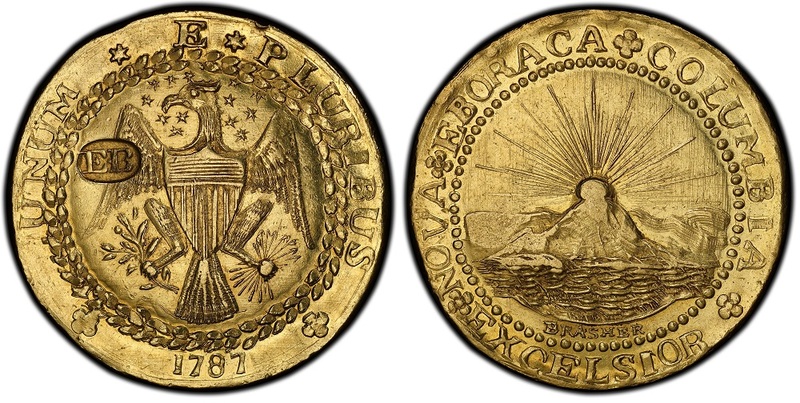 (July 26, 2018) — One of the legendary 1787 gold Brasher Doubloons and seven of the finest known 1780s New York colonial era copper coins will be displayed together for the first time in an educational exhibit hosted by the Professional Coin Grading Service (PCGS) at the American Numismatic Association 2018 Philadelphia World’s Fair of Money, August 14-18. “The lettering and some design elements of all seven of these distinguished coins are punch linked, and each of these coins is an important part of early American history and numismatics. They will be exhibited at the PCGS booth, #1431, during the 2018 ANA convention,” said PCGS President Don Willis. Only seven Brasher Doubloons are known; six with the designer’s “EB” hallmark on the eagle’s wing, one with it on the eagle’s breast. The coin that will be displayed in Philadelphia has the hallmark on the eagle’s right wing, and it is the discovery specimen for Brasher Doubloons that was first documented in 1840. This famous coin was exhibited at the 1964 New York World’s Fair, was a featured display in a national touring exhibit for the 1987 bicentennial of the United States Constitution and was displayed at the Epcot theme park at Walt Disney World in 1988. 1786 Small Head Non-Vi Virtute Vici (“Not by force, but by virtue we have won”) with a portrait believed to be George Washington. Less than two dozen examples are known. 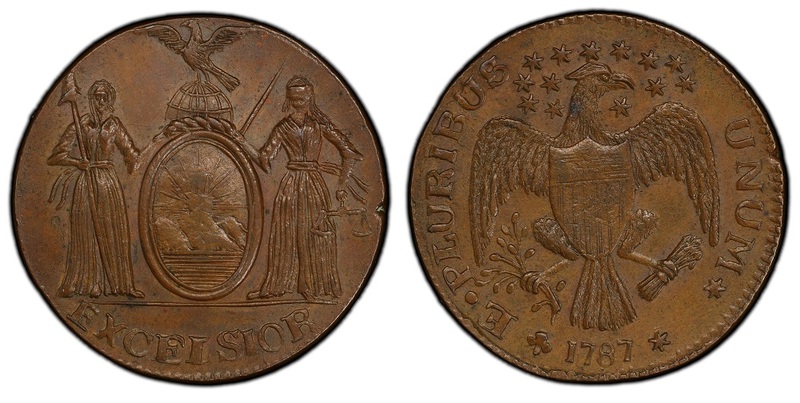 The only known Mint State example of a 1787 Excelsior, Eagle Left New York copper will be among the historic early American coins on display at the PCGS booth during the ANA 2018 Philadelphia World’s Fair of Money. Photo credit: Professional Coin Grading Service. 1787 Excelsior, Eagle facing left. This is the only Mint State example known and was formerly in the famous Garrett Collection. 1787 George Clinton cent, with New York coat of arms, less than a dozen known. 1787 Excelsior, Standing Indian/New York arms, one of only about 12 known. One of the finest of only about 14 known examples of the 1787 Excelsior, Standing Indian, Eagle on Globe design New York coppers will be part of the PCGS display of early American rarities at the ANA 2018 Philadelphia World’s Fair of Money. Photo credit: Professional Coin Grading Service. 1787 Excelsior, Standing Indian/Eagle on Globe design, one of the finest of only about 14 known. 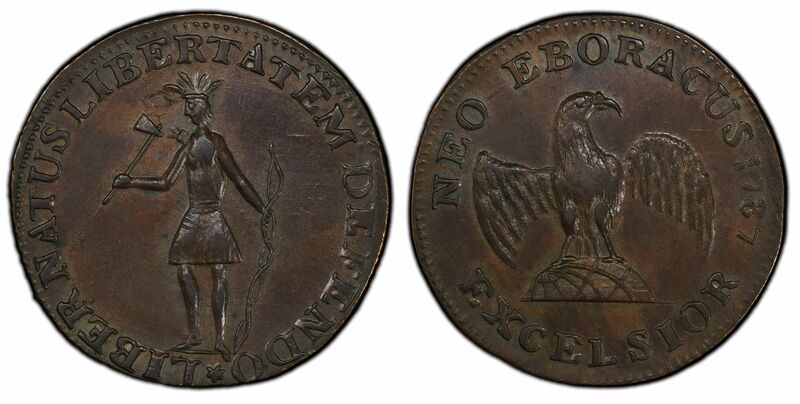 1787 Nova Eborac (“New York”), rare Large Head variety, one of the finest of only a few dozen known. 1787 Nova Eborac, Small Head variety, less than a dozen known and closely linked to the Brasher Doubloons. This is the finest certified example and was formerly in the C.I. Bushnell and Eric P. Newman collections. “PCGS is proud to work with the owners of these impressive, early American rare coins so visitors to the ANA convention can see and enjoy them in person,” said Willis. Since its founding in 1986, PCGS has certified over 38 million coins with a total market value of over $33 billion. For information about PCGS products and services, including how to submit your coins for authentication and grading, visit the website of PCGS or call PCGS Customer Service at (800) 447-8848.